Find peaceful tranquility at this adorable 1BR casita tucked in an upscale gated community just 7 minutes outside downtown Paso Robles. Located on a 5-acre estate, this welcoming getaway boasts a lake, grill, and fire pit, all shared with the main house on the property. Spend the day visiting famed wineries and vineyards, then return home to enjoy a relaxing soak in your private hot tub (which is for the exclusive use of guests in the casita). If traveling with a larger group, the 2BR/2BA main house can be rented along with the casita for additional space. Host a movie night on the 55” TV in the living room, where comfortable seating is available on a reclining love seat, a futon, and a fun cheetah print accent chair. An electric fireplace keeps things cozy. Easily craft delicious home-cooked meals in the well-stocked kitchen, featuring a full suite of all-white appliances, including a gas range. Other useful kitchen tools include a full knife set, a toaster, and a retro coffee maker. When you’re ready to eat, set the dining table for four. The casita sleeps two guests in the bedroom, which is outfitted with a luxurious king bed. The bathroom has a tub/shower combination and is stocked with complimentary starter supplies of toiletries and bath amenities. 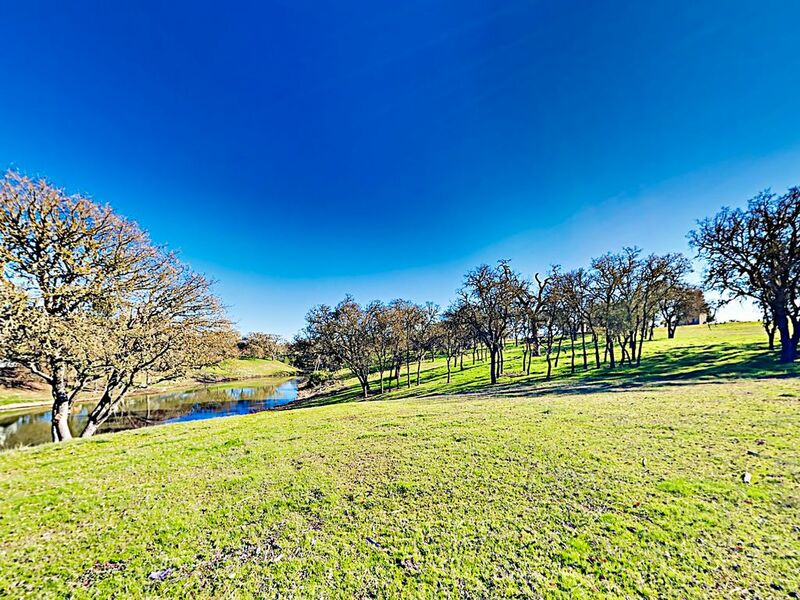 Explore 5 acres of rolling hilss dotted with stately oak trees surrounding the casita. Barbecue burgers on the grill, or use one of the provided fishing rods to cast a line in the private lake, which is shared with the main house. Next to the lake, a patio has a wood-burning fire pit and seating for four, in addition to a picnic table. Gather around a four-person bistro table on the casita patio and sip a glass of Paso Robles wine. The private hot tub is the perfect spot for a soothing soak at the end of a fun-filled day of explorations. Guest amenities include complimentary Wi-Fi, a washer/dryer, and parking for one car in the driveway. There is no parking for trailers or RVs. Tucked in the gated community of Circle B Springs, this home is just 7 minutes from downtown Paso Robles, home to a variety of fine dining establishments, nightlife destinations, and other attractions. Within a 10 minute drive, you can visit a number of wineries, including Eos Estate, Mitchella, Robert Hall, Eberle, and Norman. More than 200 wineries and vineyards in total can be found within the Paso Robles Wine Country borders.